My optometrist tells me that "at about 40" is when men can expect to start peering over the tops of their glasses to see tiny things (he says that women, in one of the few cases where they get a raw deal in comparison to men, reach this stage in their early thirties). Well, Bisporella citrina is decidedly one of those tiny things requiring an OMHT (Old Man Head Tilt) to bring into focus, if one has crossed my optometrist's line in the sand; it has a maximum cap size of about three millimeters. 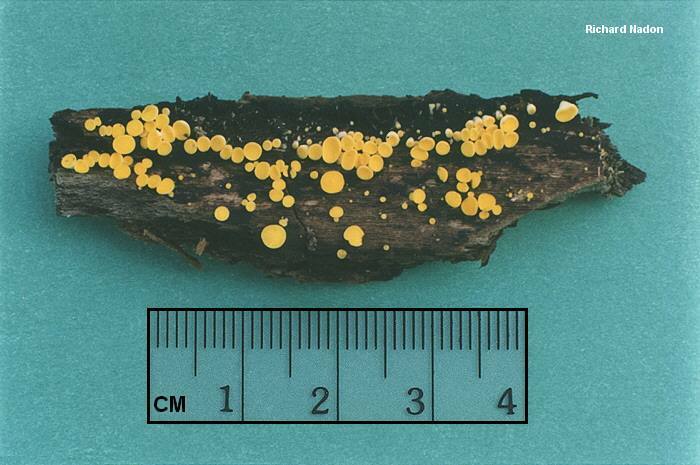 For those young enough to examine the mushroom casually, the defining features are the diminutive size, the bright yellow color, and the habitat in clusters on decaying wood. Microscopic features should be verified, however, if your identification effort is more than casual. The mushroom is widely distributed and common but often (obviously) overlooked. Helotium citrinum and Calycella citrina are synonyms. Hymenoscyphus calyculus is similar, but has a well developed stem and fruits on sticks and twigs, rather than logs or stumps. Ecology: Saprobic on decaying logs and stumps of hardwoods and conifers; growing in dense clusters; summer and fall (over winter in warmer areas); widely distributed in North America. Fruiting Body: Cup shaped to disc shaped; up to 3 mm across; smooth above and below; with a tiny tapering stem or nearly without a stem; smooth; uniformly bright yellow. Microscopic Features: Spores 9-14 x 3-5 µ; elliptical; with an oil droplet at each end; smooth; often septate by maturity. Asci 100-135 x 7-10 µ. Paraphyses narrowly cylindric, with rounded or slightly clavate apices. REFERENCES: (Batsch, 1789) Korf & S. E. Carpenter, 1974. (Fries, 1822; Saccardo, 1889; Dennis, 1968; Breitenbach & Kränzlin, 1984; Phillips, 1991/2005; Lincoff, 1992; Horn, Kay & Abel, 1993; Evenson, 1997; Barron, 1999; McNeil, 2006) Herb. Kuo 10280704.